Today is National Bundt Day. November 15th was first designated as such 5 years ago by Nordic Ware, a U.S.-based kitchenware company best know for their Bundt ™ pan. For the past 3 years Mary, The Food Librarian, has celebrated by making 30 bundts in the 30 days leading up to National Bundt Day. It's an impressive feat and I am amazed by how many different bundt-shaped pans she owns. It's quite a collection! She asked her readers to join the fun by making a bundt of our very own. I decided to booze it up and make a bourbon-soaked chocolate bundt cake using a recipe I found in the New York Times. The recipe calls for 1 cup (250 ml) of bourbon or any other whiskey. That seems like a lot of alcohol and you can definitely taste it, but I don't think it's too much. I'm not at all a drinker and I thought it was the perfect amount of bourbon to go with the dark chocolate cake. 1. Grease and flour a 10-cup-capacity Bundt pan (or two 8- or 9-inch loaf pans). Preheat oven to 325 degrees F. In microwave oven or double boiler over simmering water, melt unsweetened chocolate. Let cool. 2. Put espresso and cocoa powders in a 2-cup (or larger) glass measuring cup. Add enough boiling water to come up to the 1 cup measuring line. Mix until both powders dissolve. Add whiskey and salt; let cool. 5. Transfer cake to a rack. Unmold after 15 minutes and sprinkle warm cake with more whiskey. Let cool before serving. Optional: Dust cooled cake with confectioners’ sugar. 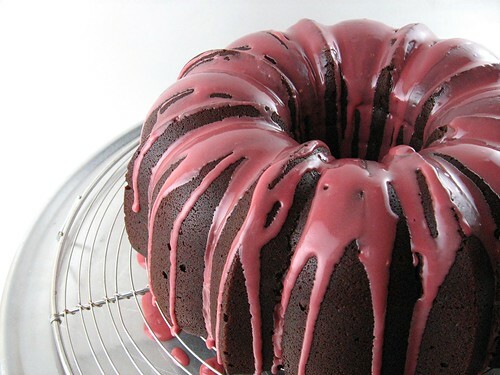 Or you can drizzle the cake with a glaze like I did. I don't have exact measurements for the glaze. It was approximately one cup of confectioners' sugar and I added some of the syrup from the Luxardo cherries until I liked the consistency of the glaze. I also added a few drops of bourbon to the glaze too. 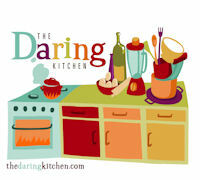 Hi Congratulations for landing on the 43rd spot of the list of top 50 Baking Blogs. I was browsing for recipes using the Kitchenaid 5 speed blender when I stumbled upon the list. Going over them one by one. I thought I'd post the comment in case you don't know you're top 50. Never tried a cake with bourbon in it - sounds like it might be a bit strange but then again could give it a bit of a kick!